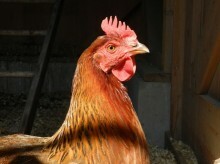 Chickens are fairly simple animals to take care of. The day to day flock management takes only a few minutes. 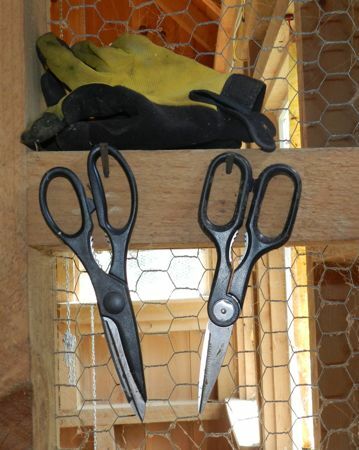 Overall good health can be maintained by keeping the coop clean, dry and well-ventilated, and by giving your hens plenty of space, good food and clean water. Enclosures should be as predator-proof as possible. Still, birds get injured, they get attacked, and they get sick. When that happens, you want to have the tools at hand to care for them. It’s always useful to have scissors. You never know when you’re going to have to cut off a tangled string, trim some feathers, or cut a piece of duct tape. I also keep a pair of sturdy gloves within reach. Almost everything else in my coop emergency medicine cabinet fits in this case. I keep it in the barn. Rubbing alcohol, gauze, and vaseline have a multitude of uses. Disposable gloves not only protect you from handling gross stuff, but they help to prevent the spread of germs. Duct tape is essential! Among the many uses, I’ve made it into hats to protect pecked-on heads, and fashioned sturdy band-aids out of it to cover wounds. 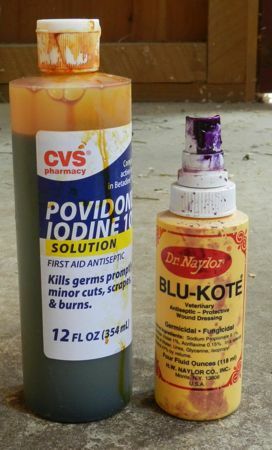 Two other essentials are blu-kote (gentian violet) and povidone. The povidone is the expensive version of betadine. It effectively kills germs and does wonder on red, irritated bottoms. The blu-kote, also a topical antiseptic, (though not as powerful) has the added benefit of darkening red skin which reduces pecking. Both are permanent stains, which is one more reason to have those disposable gloves on hand. 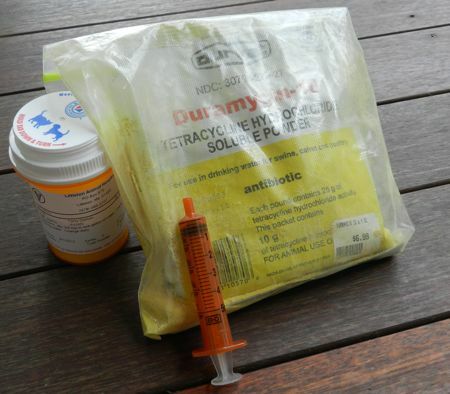 If you do have a chicken with a wound, then topical analgesic and antibiotic creams can be used. 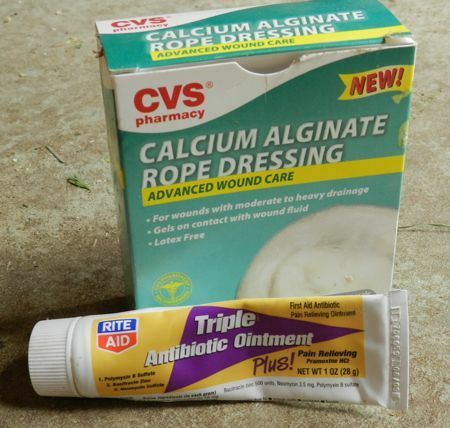 The other product that you should know about is the calcium alginate dressing. If your chicken gets a puncture wound (a dog will do this) then you can pack the wound with this dressing. 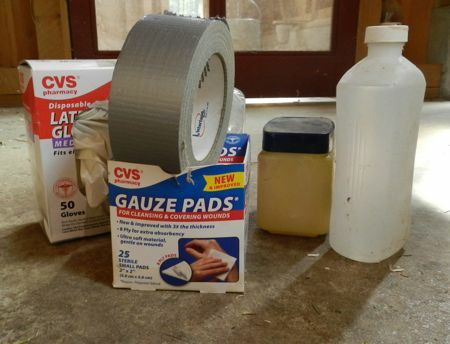 Don’t buy these items ahead of time, as they have a limited shelf-life, and storage in a hot and/or freezing barn limits their effectiveness. But, once you do have them and use them, don’t put them back in the house with the products you use on yourself! 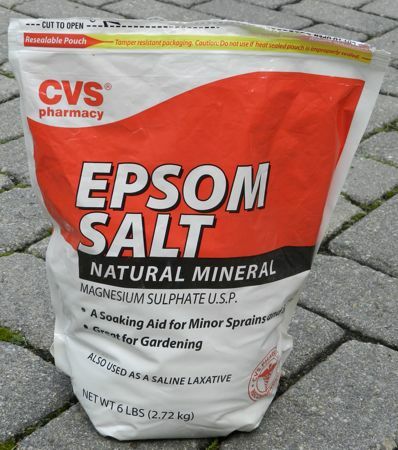 If you’ve been reading this blog for awhile you know how much I believe in epsom salts, which can be used both internally and externally. The “spa treatment” of a warm epsom salt soak helps with laying issues, abdominal swelling and irritated skin. (Follow the package directions.) Epsom salt, when ingested, can neutralize toxins, help get the intestinal tract moving, reduce runny poo and treat vent gleet. Olive oil is also one of those cure-alls. When a hen looks poorly and isn’t producing manure, I want to get things moving. A dose of a tablespoon, poured down the throat, can sometimes loosen blockages and help. Lastly, there are times when the only thing that will save your flock are antibiotics. 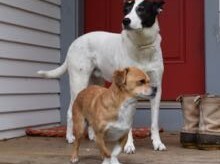 These can be purchased online, at feed stores and from your veterinarian. There are many on the market, and you’ll read that some are better for certain respiratory diseases than others. This is true, but unless you take your chicken to a vet and have blood work done, you won’t know what you have. Symptoms can be deceiving! I dose with what I have, and if symptoms don’t improve in 24 hours, I reassess the drugs that I’m using. Don’t purchase ahead of time as they have a limited shelf-life. But, once you have them, store in a safe place (preferably with a cool, steady temperature) and use when you need them. It’s a simple medicine cabinet. 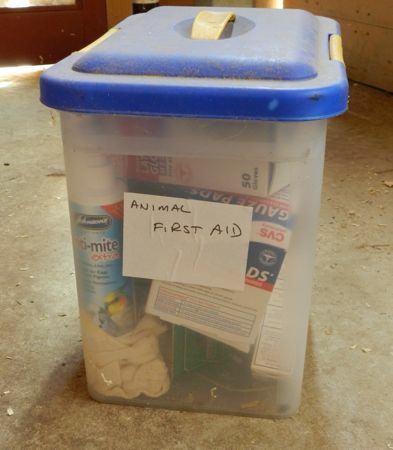 It’s most effective is you know your animals, thoughtfully observe what’s amiss, and use the products with common sense.